While the way music is listened to has changed over the years, from cassette tapes to CDs to streaming music, the love affair between music and cars has remained in sync. Turtle Wax is hitting the road with Jam in the Van this year, delivering new music to fans and keeping cars and tour buses clean along the way. Our challenge was to create an additional page which would sit on the Turtle Wax Worldwide site that celebrates the love affair of music and cars as well as maintain site consistency. Taking inspiration from the Van's paint job, we designed the page to encompass the free moving festival culture, as well as use existing components from the site to keep inline with the global online identity. 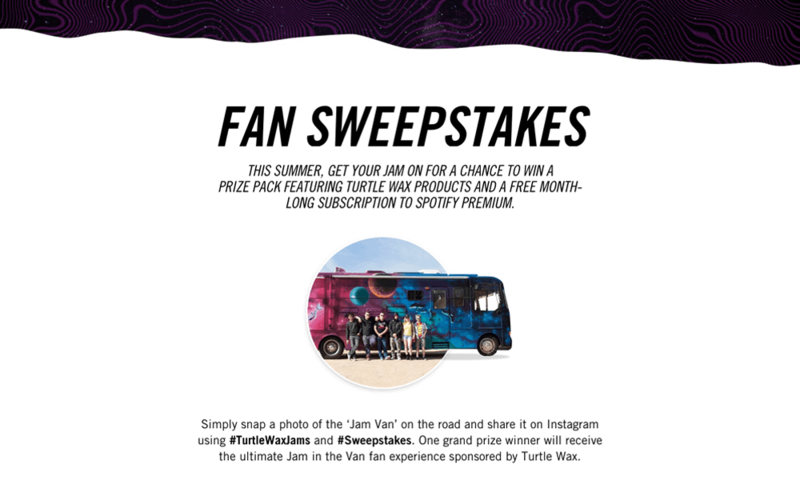 Incentivising the audience to keep an eye out for the van, we set up a competition that allowed fan's to win festival tickets and more by snapping a photo of the 'Jam Van' on the road and sharing it on Instagram. We also allowed users to get closer to the action by making the van's movements easily trackable. Bringing the latest and greatest shenanigans of the Jam in the Van's journey, the social aggregator showcases the talented musicians that celebrate the love affair between driving and music. The page has received great feedback and approval from the client, as well as further investment to improve their digital presence. The campaign has also been successful by increaing social media engagement through the 'Fan Sweepstake'.